Do The Benefits of Swaddling Outweigh the Risks? Do you swaddle your baby or are you considering it? Can swaddling be harmful to your baby? There are many different techniques for parents to try with their new baby, some more common than others. 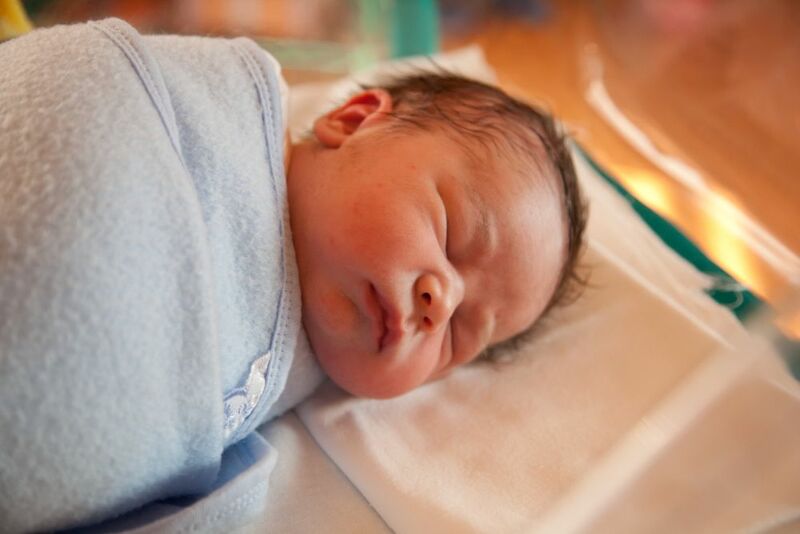 Swaddling is a popular technique, but many parents don’t take the time to research the topic. It is important to educate yourself on a technique before using it on your baby in case there are any risks involved or warning signs you need to look for. All babies are different, so if swaddling works for one baby, it doesn’t mean it will work for another. Let’s look at this technique and what it entails. Your baby is not quite used to this outside world, and a swaddle can remind them of the time they were in their mommy’s womb. A baby will be comforted by being swaddled because it is similar to the security they experienced before birth. Many parents choose to swaddle if their baby has a strong startle reflex that often wakes them when sleeping or if swaddling helps decrease crying. Swaddling is typically used for newborns until about 2.5 months of age. Many parents swaddle their babies because it’s a popular method proven to be effective. There is an entire market just for swaddles and items to help make your baby feel as if they were safe back in the womb. Helps babies sleep longer: Your baby will feel more secure and feel as though they’re close to mom. The swaddle helps your baby feel like they aren’t in a foreign environment. Creates less anxiety: The extra weight that is applied by the swaddle can somewhat resemble touch, which helps your baby relax and become less worked up. Limits the startle reflex: Your baby doesn’t quite have its motor controls figured out yet. This means they could be sleeping one minute and then experience a jerking motion the next. Whether your baby jerks an arm or leg, it’s enough to wake them up from even a deep sleep. Eliminates blankets: Many parents want to make sure their baby is as comfortable as possible. But a blanket, while it might seem comforting, can pose a serious suffocation threat for your baby, so a swaddle is a great alternative. The swaddle keeps your baby warm, but should never cover your baby’s face. Prevents face scratching: Your baby will have nails that are like razors, and they always seem to make their way to the face. Many babies scratch themselves in their sleep, enough so you notice dried blood on their faces the next day. A swaddle keeps their arms secure, and thus prevents face scratching when sleeping. Maintains safe sleeping position: A swaddle helps keep your baby on their back, which is the safest sleeping position. Not only does it keep your baby in position, but a swaddle reminds an overtired parent to lay their baby on their back. Decreases crying: If your baby seems to never be pleased no matter what you do, swaddling may be your answer. If your baby is 8 weeks or younger, swaddling can potentially decrease crying by 42 percent. Swaddling may be the key to some relief. Soothes colic: Parents who have babies with colic almost always resort to a swaddle. The extra comfort and security a swaddle provides has been known to soothe a colicky baby. Helps parents: Swaddling prevents your baby from waking themselves up unexpectedly, and helps them sleep longer. When a baby sleeps longer, parents get to sleep longer. It’s a win-win situation (source). Like most things in life, even something as simple as swaddling has risks. Some are much more severe than others and can be avoided, but it’s best to know what to look for and what to avoid. Breastfeeding interference: Swaddling immediately after birth has been known to make breastfeeding a little more difficult. Babies who rack up more skin-to-skin time with mom shortly after birth prove to take to the breast more often. This can be addressed easily if you voice your opinions to the hospital regarding immediate swaddling. It’s important to keep your baby warm, but a simple blanket over mom and baby will suffice. Effect on healthy weight: The delay with breastfeeding in swaddled infants could be a reason that some don’t put on enough weight at first. It’s also believed infants need touch to thrive, and a swaddled baby is not receiving that vital skin-to-skin touch. Your body heat can help keep your infant warm, so choose to limit swaddling on occasion. Body heat: It’s been proven infants who experience more skin-to-skin time with mom after birth stay warmer longer than children who are swaddled. A swaddle can also cause your baby to overheat. You can choose to dress your baby in light clothing, or choose a swaddle that consists of light cotton or other materials. Hip dysplasia: The position required for swaddling causes your baby’s hips and knees to be fully extended. This position can lead to hip dysplasia or dislocation of the hips. By choosing blankets specifically designed for swaddling, and making sure they aren’t too tight, you can limit the chances of your baby developing this health condition (source). If your baby was born with hip dysplasia it is important you avoid swaddling altogether. Decreased arousal: Swaddling is preferred by parents because it helps keep their baby asleep longer, but swaddling can cause your baby to have decreased arousal. There are some studies that show decreased arousal can actually increase the risk of SIDS (source). Sleep dependency: If used long enough it’s likely your baby will become accustomed to being swaddled before bedtime. You could view the swaddle as a sort of sleep crutch your baby requires to fall asleep. This isn’t a bad thing, but it does mean your baby will eventually need to be “weaned” off of the swaddle (source). Choose a blanket appropriate for swaddling and lay it down in a diamond shape. You should fold the top part down slightly to make a secure area for the baby’s head. Then place the baby on top. Pull one side of the blanket across the baby and tuck it under the baby’s opposite arm. Fold the bottom part of the blanket up and over the baby, and secure it behind the baby’s shoulder. Pull the remaining side of the blanket across the baby’s chest and secure it by tucking it underneath (source). The best blanket to use for swaddling is one specifically designed for it. There are also swaddling “sacks” that secure with Velcro and ensure your baby has proper mobility. Swaddling is used by parents as a way to soothe their baby and make them comfortable, but when it’s done incorrectly, there are potential risks. Here are some tips parents can follow that will help to ensure safe swaddling. Don’t over swaddle: Some parents want to make sure their baby is warm, and this can cause overheating. Your baby isn’t quite able to regulate their own temperature yet, but this doesn’t mean you have to keep them excessively warm — overheating can increase the risk of your baby suffering from SIDS (Sudden Infant Death Syndrome). Signs of overheating include damp hair and red cheeks. Secure swaddle: You want to make sure the swaddle is secure. Whether you use one of the blankets with Velcro designed for swaddling, or you swaddle your baby with a typical blanket, it needs to be secure. If the swaddle can come undone, it can potentially make its way over your baby’s face and cover the airways. Not too tight: A swaddle that is too tight can lead to joint problems. It’s recommended you use a blanket designed for swaddling, rather than a typical blanket. Specifically designed blankets are made to ensure proper mobility when swaddled. It’s also been discovered that a tight swaddle can hinder lung function, because it limits the amount of oxygen your baby’s small lungs can hold (source). Stop at the roll: When your baby learns to roll over, it’s best you stop swaddling. You should then reach out to your doctor to determine the best sleeping method. Usually swaddling can still be used as long as you leave your baby’s arms free. You don’t want to trap the arms of a rolling baby because they won’t be able to roll back over. Know the limits: Your baby may prefer to be swaddled, but you shouldn’t swaddle them all day. Your baby needs time to learn how to move around and utilize their mobility and freedom. Swaddling is best at naps and bedtime only. Ask for help: It’s important you swaddle your baby correctly. You should have someone at your birthing location teach you how to swaddle your baby properly. A safe swaddle is key to avoiding potential risks. There are varying opinions regarding swaddling and SIDS. Some studies show swaddling can increase the risk of SIDS, while others show that swaddling can help prevent it. If you’re concerned in the least bit, it’s best you discuss swaddling with your doctor to determine if it’s a good option for you and your baby. Swaddling is popular when babies are in the newborn stage. Most babies will begin to dislike being swaddled by 4 months of age, some much sooner. If you’re still wanting to keep your baby warm, you can opt for an arms-free sleep sack. Some babies enjoy the extra range of motion this allows. There are potential benefits and risks associated with swaddling and you should look into them before you make a decision regarding your baby and swaddling. Not all babies will like to be swaddled and this is completely normal. You shouldn’t force your baby into the swaddling position if it’s not comforting. If your baby doesn’t like his or her arms being enclosed, you can still swaddle with the arms out. Once your baby begins rolling over it’s important you no longer swaddle your baby’s arms. If you believe your baby is on the brink of rolling over, you should already begin leaving the arms free. Most of the risks of swaddling can be avoided if you swaddle your baby correctly. Make sure the swaddle is not too tight and your baby can move his or her legs rather freely. A swaddle is supposed to be tight, but should not limit your baby’s range of motion completely. Swaddles have a tendency to cause a baby to overheat, so make sure you don’t over swaddle your baby. Remember to practice safe swaddling, but also incorporate skin-to-skin time and time for your baby to move around freely.